Myung Dong Tofu Cabin is a Korean restaurant with two locations, San Mateo near Highway 101, and Santa Clara. 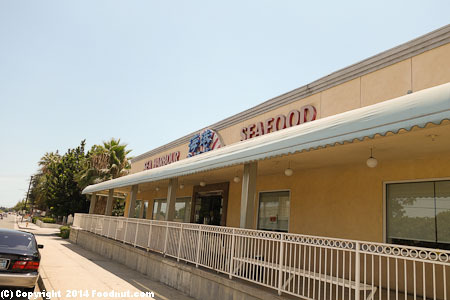 We went to the San Mateo location which is in a strip mall next to a Marina supermarket. Our 2010 revisit of the restaurant occurred in April 2010. They had dropped the weekend specials and added half orders. Decor, Vibe – Myung Dong Tofu Cabin has Generic Asian restaurant with many tables featuring cooking burners and massive fans. Many families, big groups, and people in their 30’s to 50’s were eating. The place reeks of BBQ smoke smell when you first set foot in. They use cool steel chopsticks. Beef Tofu Stew or So Go Gi Soon Doo Boo ($8.99) was very good. It came boiling hot out of the kitchen with a cracked egg on top, good broth, and soft tofu. Spicyness level is optional. Gal Bee or Broiled Ribs ($16.99, $9.99 half order) had lots of tender flavorful pieces of meat still on the bone. It was sizzling hot and included lots of small side dishes including a multigrain purple colored rice. Dol Sot Bi Bim Bab ($11.99) was Beef or pork, Vegetables & egg over rice served in hot stone pot. Included bean sprouts, carrots, zucchini, and daikon. The rice that stuck to the pot turned nice and crispy so be sure to dig it all up. It can be made spicy or not spicy. Broiled Marinated Chicken ($8.99 for half order) was a big plate of pale looking chicken that had decent flavor but was a bit too sweet. Cod Roe Tofu Stew ($8.99) was overcooked making it hard and chewy. It came boiling hot out of the kitchen with a cracked egg on top. Myung Dong Tofu Cabin had very average service. We had to chase people down to get refilled or to get items. The food is good and the prices reasonable, making this a good choice for those looking for Korean restaurants in the area, although prices are a little high.